It’s been nearly a year since Aurora Rex Rabbit Ranch introduced CHICKENS to the rabbit barn. What do we think? We love it! Summertime is when our rabbit cages are full of exuberant youngsters. Bunnies crowd the feeders. In fact, they climb up INTO the feeders, nibbling and scratching at the rabbit pellets until a littermate (or two) elbows their way up into the feeder, knocking bunny #1 the two inches back to the cage floor. It’s not just the bunny that falls. By the end of the day, handfuls of rabbit pellets have fallen through the cage wire onto the ground. With the price of rabbit feed in our area being close to $20 per 50 pound bag, seeing dusty piles of feed under half the rabbit cages used to make us feel like we’d just flushed dollars down the drain. Rabbit feed still hits the deck, but now we have a small flock of chickens that patrols the rabbit barn. They not only help control the flies by eating fly larvae, they clean up every scrap of spilled feed and other grains, and then feed us breakfast to boot, in the form of fresh eggs. What's not to like about that? 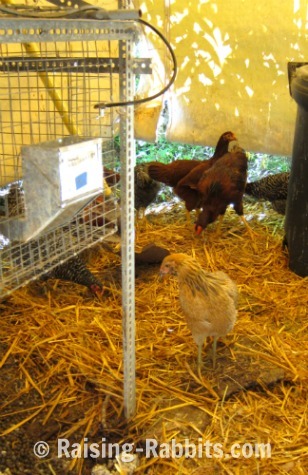 Chickens increase the profitability of the rabbitry by recycling the wasted rabbit feed. We give our chicken their own layer pellets, of course, but their feeders seem to empty verrry slowly. Would keeping a few chickens work for you too? Many municipalities allow you to keep a certain number of chickens in urban areas. We definitely recommend it! The rabbit barn is right behind the little green chicken coop. 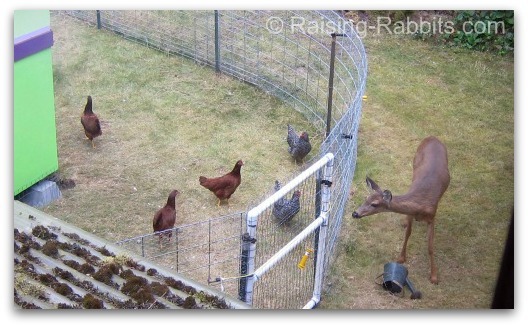 In the picture, the chickens were beak-to-nose with a deer, before losing interest and strutting off to go scratch around under the rabbit cages. The Register-Herald.com recently published a fascinating peak into a West Virginian ‘micro-farm’ that raises both rabbits and chickens. According to the article, "micro eco-farms (MEFs) and a philosophy of self-provision continue to grow in popularity in the U.S., especially for those who ... are vigilant over what they eat, and for those desiring to shrink their ecological footprint." The ability to shrink our ecological footprint. Raising small livestock such as rabbits and chickens is a great way to minimize our impact on the ecosystem. Storey Publications has asked us to write a book for them! Storey Publications is the same top-notch publishing house that brought the world Bob Bennett's Storey's Guide to Raising Rabbits, the book that is more or less the standard how-to guide for all rabbit raisers. Imagine pairing this excellent book with a second book that answers all your frequently-asked-questions about rabbits that cannot be addressed in a regular how-to book on rabbits! Even when folks have at their fingertips the very best book in the world on caring for rabbits, questions still arise that pertain to various individual circumstances, as we've discovered at Raising-Rabbits. 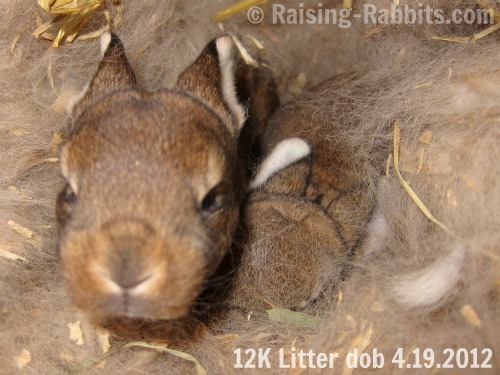 For example, what will happen if you don’t have a nest box for your doe, or if she doesn’t kindle the bunnies on time? Or, what do you do if you have two does in a cage and one gets pregnant? Can you leave them together? Can you leave the buck with the doe, or not? Won't he get lonely? We’ve been answering these kinds of questions for nearly 3 years, and we think this new book from Storey Publications, currently titled The Rabbit Raisers Problem Solver, will complement Storey's current book like a glove fits a hand. It might very well become your new best rabbit-raising buddy providing you with all the answers you could possibly need, when you need them. So, we wanted to let you know that we've been crazy-busy writing the manuscript (we're not done yet), and we apologize that this edition of our Raising-Rabbits e-zine is so horribly late! Look for The Rabbit Raisers Problem Solver to show up in book stores and on Amazon.com in the spring of 2013. We'll keep you posted, of course. In the meantime, our next e-zine will hopefully be on time! You can expect it in mid-July. Thanks again for being patient with us.